Are you feeling hungry? Would you like to eat something delicious in a unique setting? Then try one of the following top ten unique restaurants in the world, eating in a tree, in the sky or underwater. Believe me, it will be a memorable experience for you. Located in Ufa, Russia, the Schepka"Silver" Restaurant is mainly based around wood, and was designed by Russian studio Dark Design Group. 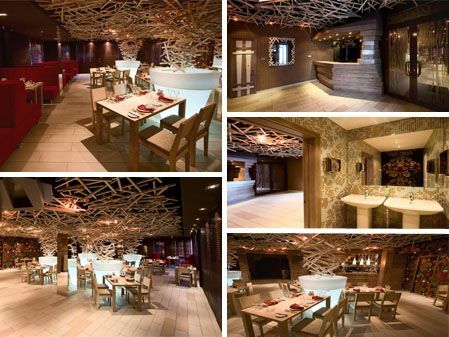 This award-winning restaurant is filled with wooden sticks on theceiling and also above each table. Does this creative concept represent the sky during a tornado or a forest canopy? Whatever you think, you are sure to enjoy your meal here! Are you feeling hungry? Would you like to eat something delicious in a unique setting? Then let’s explore!